Summary: Advice for creating a loft, discussing insulation and ventilation in a loft conversion and fire prevention for a loft. For underfloor insulation mineral wool insulation is a good choice of material. Laid between the floor joists at a depth of 250mm, not only does it provide excellent thermal and acoustic insulation, its flame retardant properties will resist fire for at least 30 minutes. This will be an important factor in complying with the Building Regulations. To prevent losing heat through the ceiling and walls thermal-check plasterboard can be fixed to the rafters and stud framework of your loft conversion. This type of insulation consists of a sheet of plasterboard with a layer of insulating foam on the back. Party walls are usually built of brick and need to be insulated to reduce heat loss and improve soundproofing. This is achieved by building a timber stud frame in front of the party wall, leaving a gap of 25mm between the back of the timber frame and the wall. Acoustic-check plasterboard is then cut to size and fitted to the frame. If the roof void behind the party is a cold space, mineral wool insulation should be fitted between the stud uprights before fixing the plasterboard. Building Regulations in relation to ventilating the converted loft space state that the total open window area should be equivalent to 5% of the total floor area. Condensation forms when warm air meets cold air. 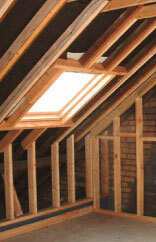 This necessitates adequate ventilation of cold spaces behind all new walls and ceilings forming the loft conversion. In most conversions ventilation at the eaves and the ridge of the roof will be sufficient to prevent condensation and the problems of damp and decay it can cause. The most stringent part of the Building Regulations relating to loft conversions is fire prevention, particularly for a loft above a second storey. We have seen how using mineral wool for the loft floor insulation can create a flame retardant barrier for at least half an hour, and how the stairs and windows should be positioned to facilitate escape should there be a serious fire. Additionally, any new doors fitted as part of the conversion should be self-closing fire doors that will prevent fire spreading for at least 30 minutes. And all internal doors leading to the stairwell on the ground and first floors should also be self-closing. Last but not least, an interlinked system of mains powered, smoke and fire detectors must be fitted on all floors including the loft and on the stairs that lead to it. A loft conversion is a major undertaking and seeking professional assistance from a structural surveyor and an architect is recommended. Even if you engage a professional builder to carry out a shell conversion – the major structural work – much work will still need to be done, requiring many different DIY skills, before the project is completed. 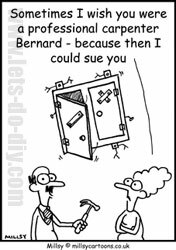 It must be stated: a loft conversion is not a suitable project for the inexperienced. But for those who believe they have acquired the requisite skills, turning a redundant roof space into a modern and pleasant living or work area will find this project very rewarding.